We can see that the robot learns over time, mastering it’s effectiveness after 10 years. It is reprogrammed and upgraded every five years to adjust to current trends. The business model is set to work ten hours/day, five days a week, and go idle over the weekends. Sunday is programming day, scheduling goal based tasks for the 5 days ahead. Saturday the robot debriefs, doing a data recalculation to help it perform better in the future. Given the power demands of the machine, it works best in 50 minute intervals, followed by ten minutes of rest. For business goals, ten weeks seems to be ideal. 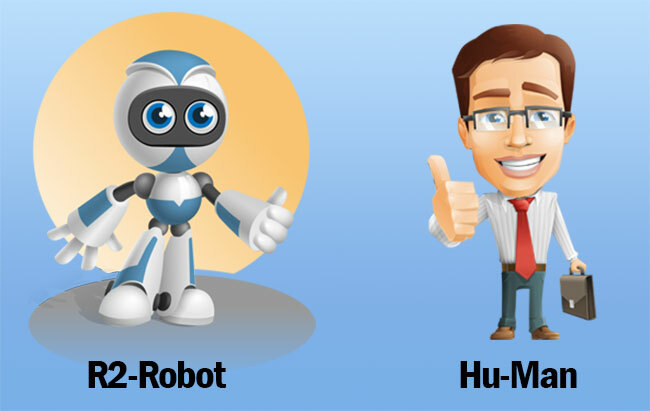 While our inner robot wants to be like R2, there are some important differences. We don’t wake up at full on mode. We take time to warm up, and may need external stimulants to get us up to speed. We need external time management. Our internal clock is not always accurate. Given our creative and curious nature, we are easily distracted, especially with bright shiny objects. To get work done in a productive manner, we need to turn off distractions, set a timer for our desired work period (50 minutes) and do one thing at a time. We do not multitask well, slowing down considerably when faced with multiple projects at one time. We have a limit of how focused we can be during the day. We have an internal scolding parent complex that may stop us cold if we are micromanaged. Leaving our programming flexible allows our creative mind mapping cycles to flourish. Our goals and tasks need to be outlined and framed with a positive voice. We do not respond well to negative impulses but are goal oriented, enjoying our lives best when making progress to a worthwhile outcome. Given our limited life spans, it is best if we make an impact on other Hu-Mans and help them reach their goals, while pursuing ours. Realizing that our programs are different than how we may perceive them, we can make adjustments and take action to get the desired outcomes that we are pursuing. I highly recommend Kelly’s book. Her insights may help you program your life for greater success. How would/do you program your inner robot for success?